Pay close attention to your mean thoughts. and relief to dry soil. Don't look so sourly on your sourness! may be what leads you to joy. Don't call it a dead branch. Call it the live, moist root. and be through with waiting. "Eyes-Shut Facing Eyes-Rolling-Around" [excerpt] by Jalal ad-Din Muhammad Rumi, from Delicious Laughter: Rambunctious Teaching Stories from the Mathnawi of Jelaluddin Rumi, edited and translated from the original Persian by Coleman Barks. © Maypop, 1990. Curator's note: I hesitate to use excerpts. In this case it feels reasonable, and not only because the final two stanzas of the original text, not included here, are distinctly different in both content and tone. Coleman Barks himself admits that the poems in this rowdy collection are "not discrete (or discreet) poems in any sense" but rather "buckets lifted from a whole." Even the titles are his own "whims." 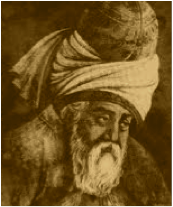 Rumi used none. So, in deleting the final stanzas for our purposes, I've basically just slopped a few lines from the bucket. I encourage you to read the full original text sometime. I'd happily point you to it online, but tellingly, I can't find it anywhere. 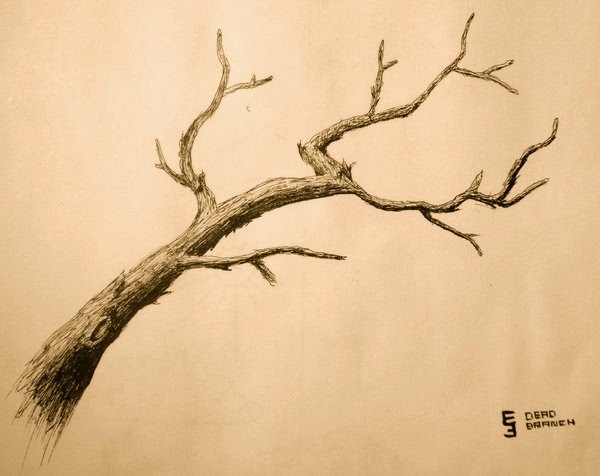 Art credit: "Dead Branch," drawing by Eisen Feuer (originally black and white).